The M&H slicks are from an original AMT 1928 Ford Model A kit, with the white walls painted. The magnesium-painted twelve-spoke front wheels from an AMT 1956 ford kit. Lyle says the chrome-plated rear steelies are a partsbox find. 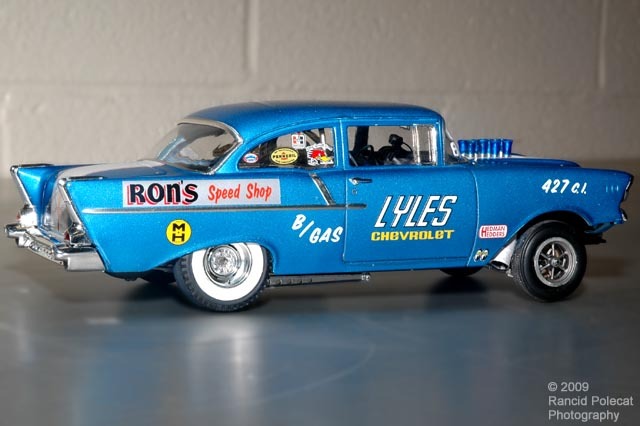 Lyle sourced the big block engine from an AMT 1963 Chevy II funny car kit and "anodized" the injector tubes with Tamiya Clear Blue. He scratch built the headers from plastic rods and fully plumbed and wired the engine. Inside, he modified the kit-supplied roll bar, added seatbelts for the driver's seat, and added a tach, extra gauges, and a Hurst T-Handle shifter.